It’s a stormy day here in Massachusetts today, complete with thunder and lightning. It seemed the perfect day to break out the Jo Malone candle that I was sent to review. 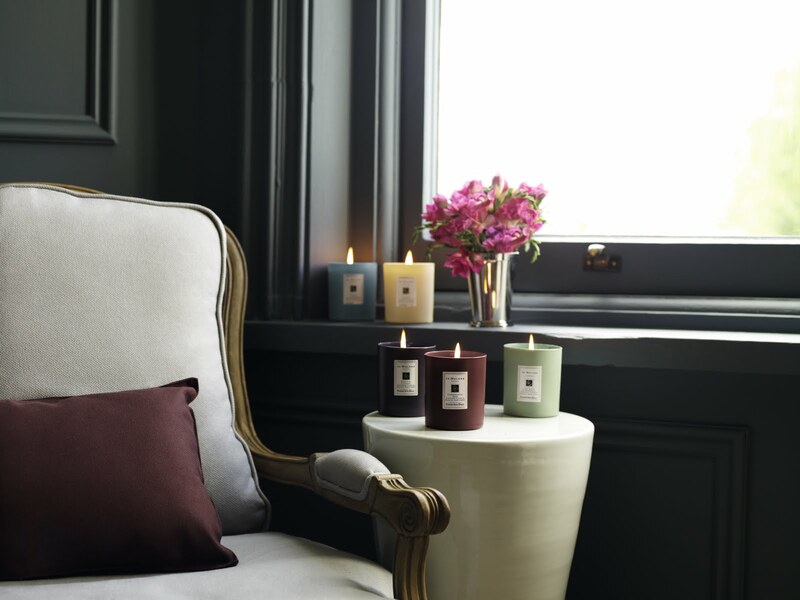 Jo Malone, known for their luxurious British lifestyle and fragrance brands and Farrow & Ball, makers of fine paints and wallpapers, have teamed up to produce a limited edition collection of candles. 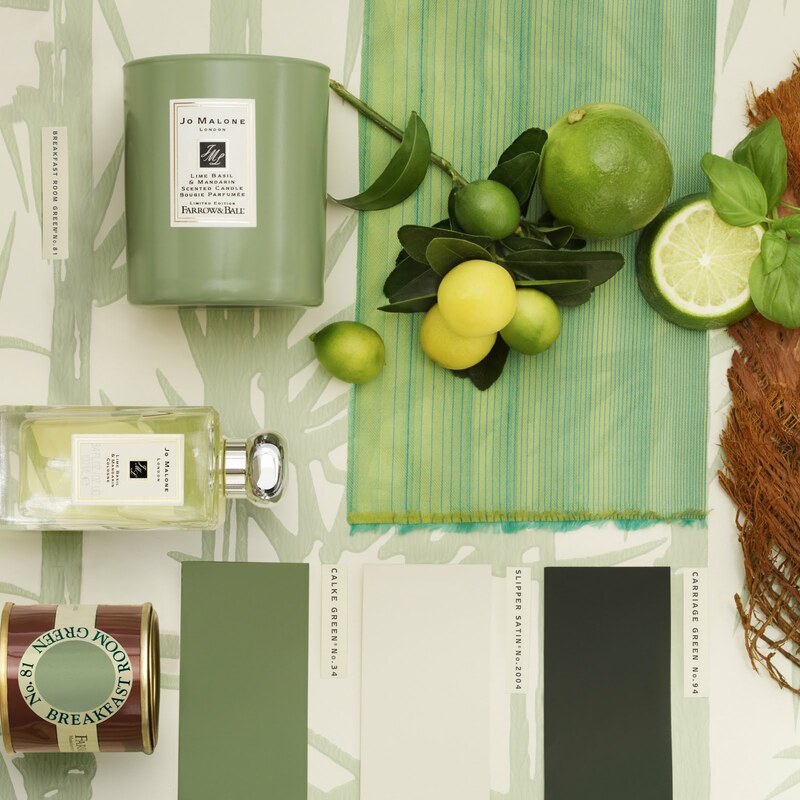 Five of Jo Malone’s scents were matched with coordinating Farrow & Ball colors to create the candles. Grapefruit in a F&B Cream No. 67 holder; Lime Basil & Mandarine in a F&B Breakfast Room Green No. 81 holder; Wild Fig & Cassis in a F&B Pelt No. 254 holder; Pomegranate in a F&B Eating Room Red No 43 holder; and Blue Agava & Cacao in a F&B Oval Room Blue No. 85. And, they say you can mix and match the scents as well. I’ve been burning the Lime Basil & Mandarin candle for several hours and the scent is subtle and not cloying at all. I have allergies to many scents and can rarely burn scented candles, but so far so good on this one! The candles are available at Farrow & Ball Showrooms and stockists, Jo Malone Boutiques and specialty stores like Bergorfs, Neimans and Saks. Hope you’re having a great weekend! Happy Mother’s day to all the Moms! Trends: Too much of a good thing? I love the joe malone scents. I actually wear lime, basil and mandarin so I'm relieved to hear it didn't smell too bad. lol. I'll definitely be giving these a try, thanks for sharing! These candles sound wonderful, the scents must be divine!! Lime Basil & Mandarin is one of my favorite scents by Jo Malone. What a brilliant marketing move by F&B to pair up with Jo Malone. I wound up purchasing two. They are the perfect accent for our bathroom. First off, I think Jo Malone products are wonderful. Second, what a cool concept?! And last, that fragrance sounds delicious….lime, basil, mandarin?! I'm sensitive to many scents so I'm glad to hear this one didn't trigger any allergies for you. Keep us posted if you try out others (or if you have an allergy attack!). Love these candles! Love them. Hope you are well. I'm taking it you've been as busy as I have. Talk soon. Great Tip Linda… and by the way, congrats! I just noticed that you are the official blogger for New England Homes! (This may be old news and I'm just cluing in – but you're perfect for the job!). Stunning Photography. Cannot keep my eyes off!! What a great partnership between the two. I wish I had some of those gorgeous candles to make me smile…I am in Venice and it is thunderstorms wheather here also! Fascinating lights in the sky though. Ciao.